Recently, our friends purplelady10us and Faith got together to help each other rank up in Blooop. Using their method outlined below you and a friend can earn 25 points per game. For those of you who have never played Blooop before, this will help you rank up extremely quickly. In just four games played this way, you and your friend will be rank 10 and earn the first in-game badge. There may not be a faster ranking game in all of Pogoland! If you don’t have a friend to play with, you can always double-browse and earn ranks for yourself and your most favorite secondary account. 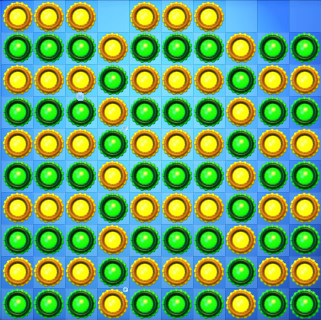 In Blooop your board is a 10-row, 10-column grid. 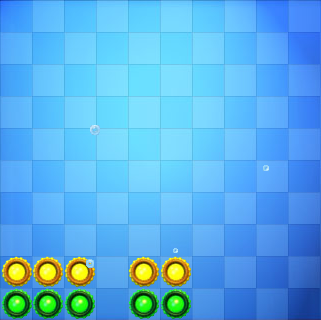 The first player leads by placing their token in the 1st column (bottom left, shown below as a green token). 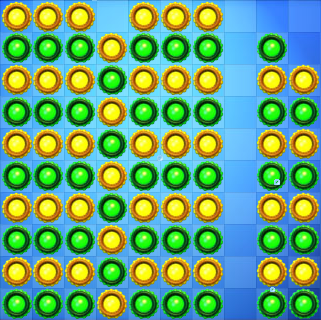 Then the second player (yellow, in this example) will place their token on top of the first players’ token. You will continue alternating your tokens all the way to the top of the first column. Repeat this for columns 2, 3, 5, and 6. Next, continue the alternating pattern to the top in columns 1, 2, 3, 5, 6, and 7; and then in columns 9 and 10 to only the 8th row. 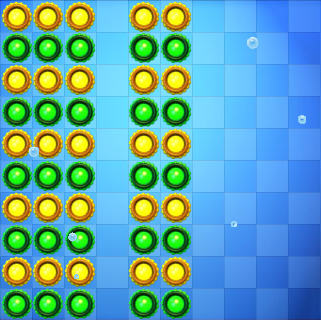 Once you have your board set up as shown above, the first player places a token at the top of column 9, and second player places a token in the empty column 4, and then continuing the pattern in column 4 until there are only 9 squares filled. 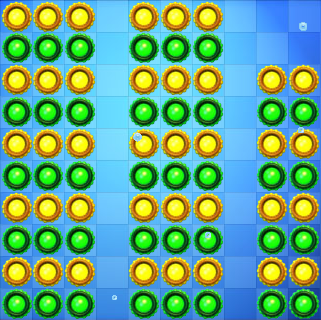 Then first player will place their token on top of column 10 and second player will place their token in the empty column 8 and build the pattern to the 9th square. The last token is placed by the first player on top of column 10. This makes a diagonal match and causes the a cascade of matches and points! Sit back and watch the pretty grids start clearing. The final result: a tie score of 25-25, both players earn a jackpot spin, and each player ranks up quickly! Good luck and have fun!